Solar eclipse weather forecast: Will cloudy skies spoil it for you? Cloudy skies over Scotland, Northern Ireland, North West England and North Wales could make the solar eclipse difficult to seeCloudy forecast: The solar eclipse may not be visible for all. The long-awaited solar eclipse will plunge our skies into darkness this Friday – but will we be able to see it? Looking at the latest weather report, the best chance of catching a glimpse now falls within a narrow area stretching from north east England, through Wales and south west England. After a cloudy start to Monday, high pressure will build by Wednesday, bringing with it clearer skies and sunshine. But, by Friday morning, low pressure is forecast to pass just north of Scotland and Northern Ireland, causing cloud cover, according to The Weather Channel UK spokesperson Leon Brown. Solar eclipse glasses: Why do you need them and where can you buy them? 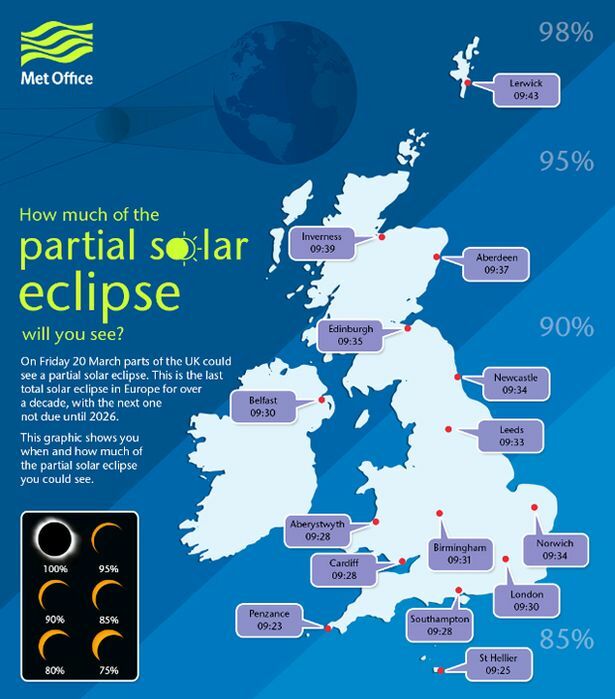 Cloudy skies, which could make the eclipse difficult to see, are also forecast over North West England, North Wales and South West Scotland – some of the areas where the percentage coverage of the eclipse will be at its highest. This could therefore mean views of the solar spectacular will be significantly restricted. 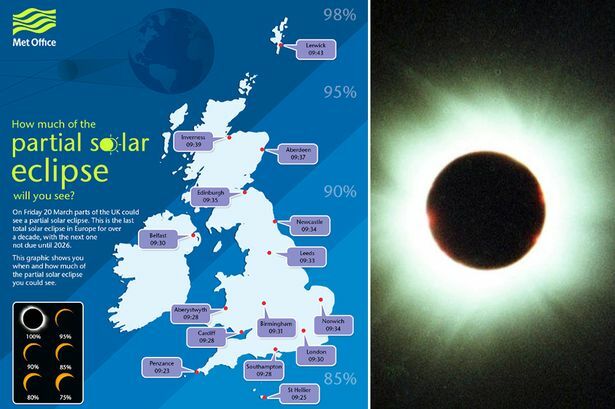 Solar Eclipse 2015: Where is the best place in Britain to watch it? But astro-tourists further down the country can breathe a sigh of relief, as much better weather is forecast in the south. Between 9am and 10am on Friday, skies should still be fairly clear over southern England, Wales and the Midlands, providing a better view of the eclipse. After all the excitement of Friday is over, brace yourself for a rather chilly weekend after low pressure moves over the North Sea on Friday. It will bring with it a cold front, which will move down across the UK and a gusty north east wind is expected. Showers will move south throughout Monday and Tuesday with sleet at lower levels and some snow over high ground. The middle of next week is expected to be mainly dry before the weather turns more unsettled again from the north west. A much wetter spell of weather is forecast from the end of next week and for the run up to Easter.